Sending your field service management technicians out on a job doesn’t need to be a blind procedure. Digitizing your field service management business operations is easier than ever with Smart Service field service management dispatch software. You can keep track of technician location, receive job updates in real time, and integrate forms and information through QuickBooks. Optimized routes allow your technicians to spend less time getting to the job and spend more time working with the customers. On the job, your technicians can collect electronic signatures, fill out digital forms, and receive payments. Optimization is our middle name, full-service mobilization is our game. Smart Service functions as an add-on to QuickBooks so your fleet service management company can access your customer information, schedule jobs for your technicians, and more without double data entry. Whether you use QuickBooks Pro, Premier, Enterprise, or Online, whole system integration is available with the push of a button. When you have a new job request, just open Smart Service, find an active and available technician, and type your customer’s name. Smart Service will pull up all the information you need. Say no to hassle and yes to QuickBooks integration. Tired of spilling your coffee on paper forms? Losing files in your office? Does copying customer information put your brain in a scramble? Digitize your field service management business with the Smart Service mobile app! Forms are accessible on your mobile device. Customers can sign documents, and then you can receive their payments. Information logged through the app then connects back to the office. You can generate invoices because Smart Service field service management dispatch software connects with QuickBooks as well! The Smart Service app for field service management sure is handy! Your field service management business wastes money every day on paper invoices, notes, and forms. Then even more money is sent down the drain paying somebody to copy all of this information into your system. Why throw money down the drain when you can just use Smart Service field service management dispatch software? Your technicians will also spend less time traveling to jobs thanks to optimized routing. What makes Smart Service such a good field service management dispatch software? Request a demo today and see how our field service management dispatch software will digitize and mobilize your business operations! 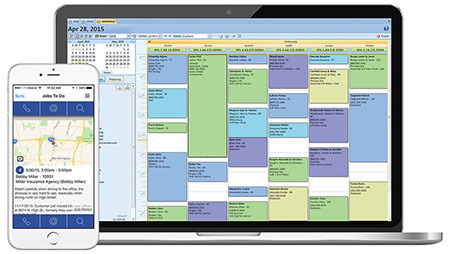 Manage schedules, invoices, and dispatch for your field service management business. Want to learn some field service management business tips?